Inquire for Best Rates! Be sure to check out reviews! Why should you rent this condo? We recently remodeled the unit and continue to make frequent upgrades. We replaced and updated practically everything including new appliances, countertops, flooring, window treatments, furniture, and bedding. We put HD flat screen TV's in each bedroom. This remodel underscores our commitment to 100% customer satisfaction. We pride ourselves in the property AND our customer service. My goal is for every guest to write a 5-Star review on VRBO. We are committed to doing what it takes to attain that level of guest satisfaction. Located on the 12th floor and overlooking the pool and gulf waters, the balcony is appointed to entertain friends or enjoy your morning cup of coffee. The 12th floor is high enough to enjoy the views and beat the noise; perfect for relaxing all day. You won't find any plastic furniture here. There is a table with seating for six, a side table and two very comfortable chaise lounges. Don't settle for less! Also included is a full-size washer and dryer, dishwasher, and fully stocked kitchen. The master bedroom has sliding doors that go onto the balcony and a king size bed. The property has 24 hour security and is gated for added piece of mind. Additionally, there is an indoor pool and separate hot tub with a full gym and sauna. My wife and I grew up in Alabama and have vacationed here our entire lives. It was always a dream to one day have a place of our own. Summerhouse was perfect for us, especially with small children. Even in cold or rainy weather, we could take them to the indoor pools or walk across the street to the souvenir shop. We take great pride in providing our guests with a home like feel. The condo is decorated beautifully and everything works! The huge indoor and outdoor pools are great for families. When the kids are little and the weather isn't cooperating, the heated indoor pool is a great place to let the kids burn off that extra energy. And the 20 person hot tub is a great place for the adults to watch them. Most of the time when you are looking for a 3 bedroom condo, you have more than one couple going along on the trip. Then you have to decide.... Which couple gets the king bedroom? Well, we put a king bed in one of the extra bedrooms as well. We removed the old armoir, put a flat screen television on the wall, and were able to upgrade the bedroom with a king bed. But wait...there's more.... We also added a 2 queen beds to the 3rd bedroom. This allows families with one child to stay in one room or for all of the kids to pile in there together. This is truly a unique layout for 3 bedroom units. 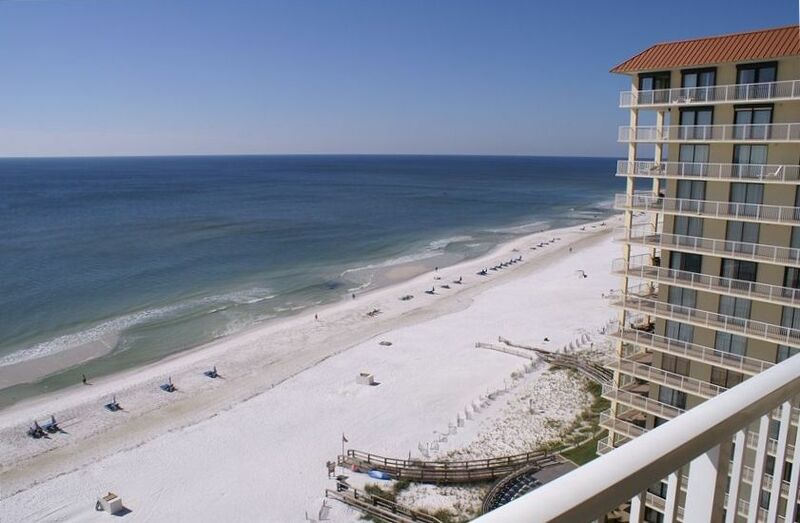 Outstanding south facing view of the beautiful Emerald Coast with both Sunrise and Sunset views over the water. In the indoor pool area. Brand new 5 burner stove and convection oven. Programmable to be ready when you wake up! Knives, stock pots, wine openers...everything you will need! Completely ready for any meal. Coffee maker, toaster provided, blender, slow cooker, wine openers, high quality knives, and a microwave for those quick meals. 3 DVD players built in televisions. Small library provided. Read a book, take a book or leave a book. Two tourts located across street. 47' flat screen LED HD television in living room. Flat screen HD TV/DVD combo in each guest room. This is the third time i’ve Stayed in this condo with my family and frankly it’s perfect. The decor is very nicely done. Our beds are comfortable. The kitchen has everything we need and the view is beautiful.. There is an indoor pool for those rainy days and a sauna and gym! the owners are very kind and responsive. If you’re looking for a place to stay that feels like home. This is it. The beach is fantastic, the weather perfect, the crowds this time of year (late October) almost non-existent. All this was topped off by the wonderful unit with a great view of the Gulf and host who certainly made the vacation perfect . Comfortable, clean and convenient to great restaurants! I just got back from a long weekend with two friends at this condo. We really could not have asked for more. The owner was so accommodating with our arrival time, and even gave us a late checkout, since he did not need a quick turnover. The condo was clean, beds were very comfortable, and kitchen was well stocked. Living area is not huge, but spacious enough that it didn't feel crowded at all for us. It's only a short walk to the beach. It was nice to go in late September, since the crowds weren't there, but the parking was very easy. We are hoping to return to this same unit again next year, and I would highly recommend it. Owners great to work with. Well furnished kitchen. Linens, decorating, everything really top-notch. This condo has all the comforts of home and is very clean. Everything was in working order with no issues including great internet access. My husband and I booked the condo 7/21 - 7/28. This was our family vacation and our 2 college aged daughters were able to join us. The location is perfect with easy access to the beach and pool. Lots of great restaurants in the area to enjoy as well! It was our first time to Orange Beach and we will be back! Thank you for the review. My wife and I strive to make your vacation effortless and relaxing. We hope to host you again! We had a great week, beautiful view from the large balcony. A king bed in two of the bedrooms plus two queens in the 3rd bedroom suited our needs well. Kid friendly pools and a beautiful beach. We would definitely consider using this condo again. Rates include cleaning and tax. $300 deposit required when lease is signed to confirm stay and rates. Summer season requires weekly rental with a Saturday arrival and departure.